Unibloc® Y-Strainers combine sanitary design with functionality resulting in an easy to use, easy to clean strainer. Features such as bi-directional flow and the strainer’s ability to mount in 360 degrees enables endless versatility. Composed of only three parts, the simple design ensures hassle free cleaning. Our new High Capacity Series allow for higher flow-rates, viscous products, and more efficient straining. 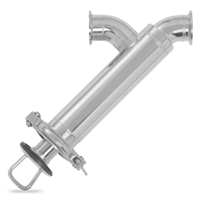 Unibloc® offers the widest selection of quality sanitary strainers on the market. High Capacity strainers – where minimal pressure drop is desired.